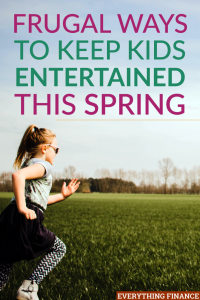 Spring is right around the corner (literally just a few days away) and as the weather warms up, kids can get restless so you’ll need to be able to think on your toes when it comes to keeping your kids entertained. Kids tend to have a lot of energy and love to get out and explore new things. Be sure to protect your baby from sunlight by using infant baby sunscreen while your both outside the house or strolling at the park. The biggest flaw I see some parents make is thinking that entertaining their kids means they have to spend a ton of money. Most times, this just isn’t the case seeing as it’s not that hard to capture a child’s attention and show them something new. If you’re looking for easy ways to keep your kids entertained this spring, keep these frugal ideas for outings and activities in your back pocket because they will come in handy when you need them. Everyone knows the library is free if you have small children, so you should take them there are often as possible. Not only can you read to your child at the library, but you can also take advantage of their free resources and programs like craft events, story time, and more. At our local library, they have a lego club a few times per week where a bunch of kids get together and build things with legos in a private room in the library. I try to bring my son as often as they have it since it’s free and fun for him. If you have older kids or teens, there are usually a few programs or clubs geared toward them too. Hosting a regular family game night can be really fun and teach your kids how to get better at playing certain games. We do a combination of board games and video games but you can also choose to focus on one of the two, like in games as CSGO, that take a certain level of skill, but you can use services as Csgo boost to help you and your kids achieve these skills faster. You can find lots of classic board games at thrift stores or garage sales for cheap. Just make sure they have all of their pieces. As the weather warms up, you’ll be able to take your kids to parks again. There was a burst of good weather a few weeks ago where I live and my son and I were both super bored, so we decided to drive down the street to a local park and meet some kids. It was great getting out of the house without spending any money and my son met new friends of course. The park can be a fun, spontaneous option, or you can plan a visit and bring extra items like chalk to draw on the sidewalk, balls so you can play games, and even food or light snacks to enjoy a picnic lunch while you let your kids play at the park for a little while. You can read a book, check emails, or simply relax and enjoy the scenery while the kids play. A garden can be an ongoing activity that you work on together throughout the summer. Kids will enjoy picking out cheap plants, fruits, and vegetables to plant and digging up holes in the ground. You can show them how to water the garden and care for their plants regularly. I tried to grow a watermelon one summer when I was younger. The experience didn’t end well but I learned a lot of good stuff about planting and it’s something that I’ll never forget. Want to keep kids entertained without spending a ton of money? Invite a few of their friends over one Friday night, or over spring break and host a sleepover. You can cook a few frozen pizzas, pop popcorn, and bake cookies. Bust out of your best games and movies. Then, just let the kids play until they fall asleep. Sometimes, hosting sleepovers seems like a lot of work, but I actually like it because I set ground rules and confine the kids to one main area so they’re not running around and tearing up the house. My son focuses on playing with his friends and I can catch up on doing other things around the house or relax in another room. Do you have any craft stores in your area or a home improvement store like Home Depot? These stores are known to have weekly free workshops for kids where they teach them how to make something interesting. Home Depot provides weekly home improvement DIY workshops for adults and workshops for kids too. Kids get to build things that they can take home. The workshops last a good couple of hours and there are projects like building a bird house, constructing a rain gauge, and making a custom Easter basket. A craft store I like that has really good free workshops for kids is Michael’s. Michael’s tends to have free classes and workshops for kids, but sometimes you have to pay for the materials. If anything, a class or the cost of materials per child is pretty cheap and can range from $2-$4. The classes and workshops at Michael’s usually teach kids how to complete a painting or decorating project or create something special that they can bring home. These are just a few fun and frugal ways to keep kids entertained. You can also have fun in the house by showing your kids how to complete a craft project on their own since you can find tons of ideas online. You can also teach your kids how to prepare an easy lunch, dinner, or dessert if they show an interest in cooking. Plus, movie marathons are always relaxing when all else fails. When it comes down to it, you just need to focus on being creative to keep kids entertained so you don’t have to spend a lot of money. How do you plan to keep kids entertained this spring without breaking the bank?